This 14K white gold vintage style smoky quartz and diamond ring gives a time-honored design a modern touch with an understated, undeniably cool gemstone. A 5mm round smoky quartz is the center stone of this lavish design, providing chic brownish-gray glimmer. 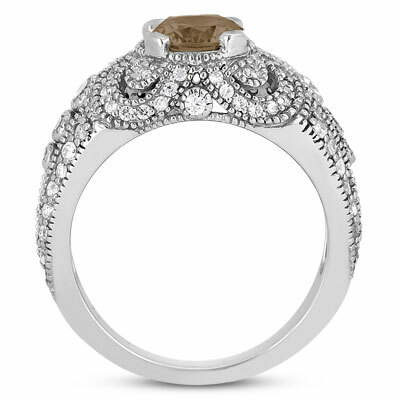 This unique gem is accompanied by over 60 round diamonds that work in harmony to create a glittering vintage design. 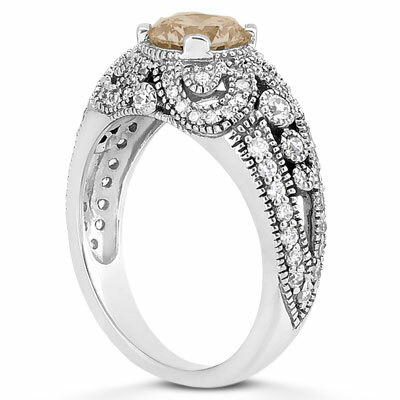 Beaded edges offset these stones in elegant fashion and add a classy touch of texture to this 14K white gold ring. 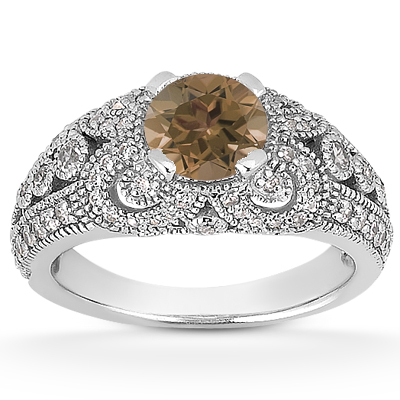 A smoky quartz is surrounded by 64 accent diamond in the vintage 14K white gold setting. Also available in 14K Rose Gold, 14K Yellow Gold or Platinum by request. We guarantee our Vintage Style Smoky Quartz and Diamond Ring to be high quality, authentic jewelry, as described above.